Today we’d like to introduce you to Fannie Koa. Fannie, can you briefly walk us through your story – how you started and how you got to where you are today. Like many acupuncturists, this is not my first career. I have been a management consultant, freelance writer/editor, teacher, marketing communications specialist… but I feel very lucky to have found a “heart” home in my current profession. I was born and raised in the Philippines as a third generation Chinese immigrant. My mother and grandmother often infused our meals with Chinese herbs to promote better health, one of my favorite memories as a kid was when my grandma would take me along to the Chinese herbal pharmacy in a “kalesa” (horse-drawn carriage) in Manila. The place smelled earthy and strange with walls that were covered with rows upon rows of little drawers containing different herbs. They still used an abacus and a handheld scale. It was like a place frozen in time. I moved to Boston to pursue an MBA and graduated into the challenging post-911 economy. It took three tries to find a stable job, and then the September 2008 financial crash happened and I got laid off. Somewhere along the way, I found out that the oldest accredited school of acupuncture in the US was located here in Boston so I finally took the time to check it out. I’d always thought it might be an interesting path, but didn’t seriously consider pursuing it except maybe as a retirement career. You ever have those moments when something lights a spark in your soul and no matter how many times you try to put out the fire, the flame simply keeps burning hotter and brighter? Walking into the New England School of Acupuncture was akin to tossing a lit match into dry kindling. 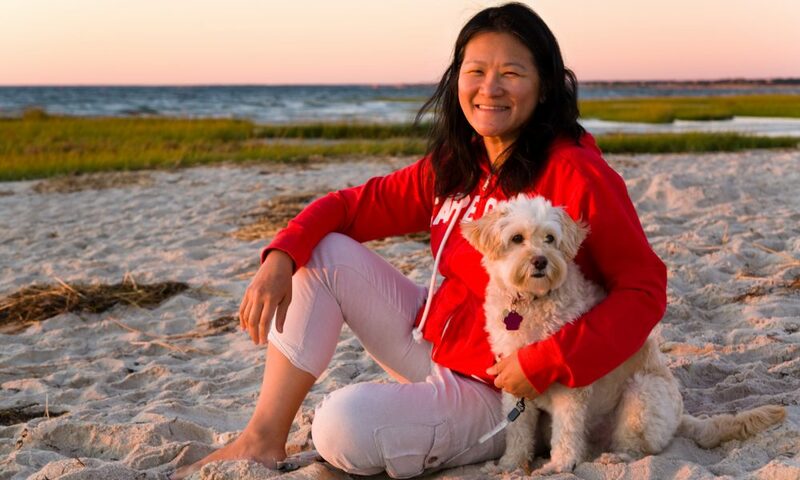 It felt like everything in my life had been leading up to this – why else would a Filipino who spent a lifetime straddling two cultures, fluent in English and Chinese, find herself living in the same town as the only acupuncture school in New England? School was just the beginning of another long journey. Since graduating, I’ve spent about four years working in different settings – community acupuncture, massage therapy – and finally started my own clinic, Flying Turtle Healing Arts, 2.5 years ago, I let go of my part-time jobs one by one, and 2017 is the first year that I am fully self-employed. It’s exciting and sometimes very challenging, but I show up every day feeling profoundly grateful to be able to do what I do. Ever heard of that expression, “life is what happens while you’re making other plans”? 🙂 No, it hasn’t been a smooth road but the journey has been worth every step. Having your own business is great when it comes to personal freedom and creativity, but it takes a while to stabilize. The financial pressures are real and can be very stressful. Since I have a business background, I am familiar with the growing pains of a new venture so I try my best to remember to stop, take a deep breath, and appreciate how far my humble little clinic has come. One of my biggest challenges as a one-person operation is setting boundaries between my personal and professional life. I’ve had people say, you must have so much free time now that you run your own business. Uhm, no. It actually never shuts down if I’m not mindful. There’s always something that needs doing when I’m not seeing patients. I’ve learned to deliberately carve out time for family, rest, exercise, and reflection. Its advice we dish out to our patients all the time: find balance in your life… but it’s so much easier said than done. Alright – so let’s talk business. Tell us about Flying Turtle Healing Arts – what should we know? Flying Turtle Healing Arts is, first and foremost, a space for healing. I built it as a safe haven for people to reconnect with the miracle of their bodies and the power of their intentions. My main tools as a healer happen to be acupuncture and Chinese herbal medicine, along with some manual therapy techniques like cupping and tuina. I specialize in myofascial pain conditions (acute and chronic), women’s issues, and anxiety disorders. I also have a special interest in topical pain remedies. I currently have a line of liniments powered by Chinese herbs that are quite effective for conditions like tendonitis, arthritis, sprains, and any kind of muscle and joint pain. One of the things that sets me apart from other acupuncturists is my specialization in Trigger Point therapy, or as non-acupuncturists call it, “dry needling”. I trained with some of the best massage therapists to hone my palpation skills and fine-tune the ability to use acupuncture needles to “untie knots in muscles”. The technique is can dramatically reduce pain and increase range of motion. I intend for Flying Turtle Healing Arts to be a haven for beginnings and endings, for both my patients and I to heal, to grow, to discover, and to celebrate. Being able to start my own practice gradually – by working part-time for others, sharing the space with another acupuncturist – were critical to surviving the first stage of growth. I feel quite fortunate to have worked with some of the most talented and passionate people around. Right after graduating from acupuncture school, I worked for New England Community Acupuncture (NECA) in North Andover, where I found myself giving as many as 40-50 treatments a week in a busy, fast-paced community style clinic. The owner, Matt Prouty, was one of my supervisors during my clinical internship and he continued to mentor me as I “grew up” as an acupuncturist at NECA. In almost four years as a community “acupunk”, I gave over 4,000 treatments – experience in numbers that I could not possibly have achieved in so short a time had I only worked in a traditional one-on-one practice. I also worked as the staff acupuncturist at 360 Neuromuscular Therapy for two years, which gave me the opportunity to work with some of the smartest massage therapists in the industry. I developed stronger palpation skills and deeper knowledge about the anatomy, especially how to reduce pain using trigger point deactivation and other bodywork techniques. The experience has allowed me to differentiate myself from other acupuncturists as a specialist in myofascial pain conditions. Needless to say, my family and friends have been a tireless cheering squad along this journey. I wouldn’t know where I’d be if not for their love and support.